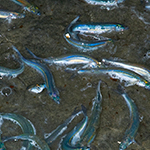 Join aquarium naturalists to see hundreds of small silver fish called Grunion ride the waves onto La Jolla beaches to spawn. Learn about the fascinating lives of these mysterious fish, hatch Grunion eggs before your eyes, and then head to the beach to observe Grunion in the wild. Prepare for cool, wet conditions and bring a flashlight. Minors must attend with a paid adult, for ages 6+.